Your donation today will give more kids in foster care the chance to spend a week with their siblings where they can "just be kids" and feel like they are in a place where they belong. Your donation will make a difference in a kids life. Please select your gift amount. Buys a birthday gift for one sibling to give to his brother or sister. Buys a sleeping bag for a kid that doesn't have one to bring to camp. Buys 1 digital camera for counselors to use all week to capture memories for kids to take home with them. Covers decorations for the birthday party event where siblings exchange gifts and celebrate important milestones. Covers the cost of printing all the photos needed so each kid can take home a scrapbook with pictures of their siblings. 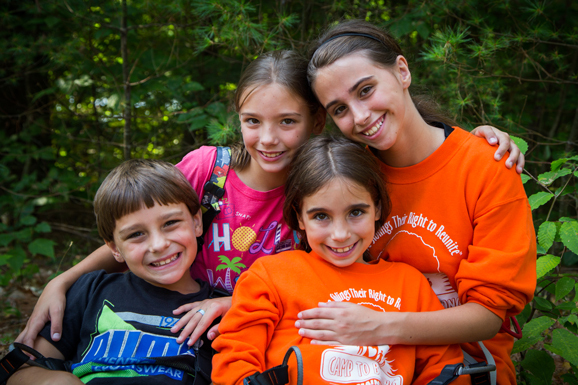 Reunites 2 siblings for week at Camp To Belong. Donate 100% - Add 3% so that 100% of the donation goes to Camp To Belong. Camp To Belong has partnered with Network for Good to securely process your online credit card payment via Network for Good (tax ID 68-0480736). This transaction will appear on your credit card statement as "Network for Good." This transaction is subject to Network for Good’s Privacy, Security & Disclosure Statement and the Charitable Solicitation Disclosure.